The other day I was quite happy to be mentioned in one of my favorites blogs "Caracas Chronicles", mostly because I started this blog after being an avid reader of their own. 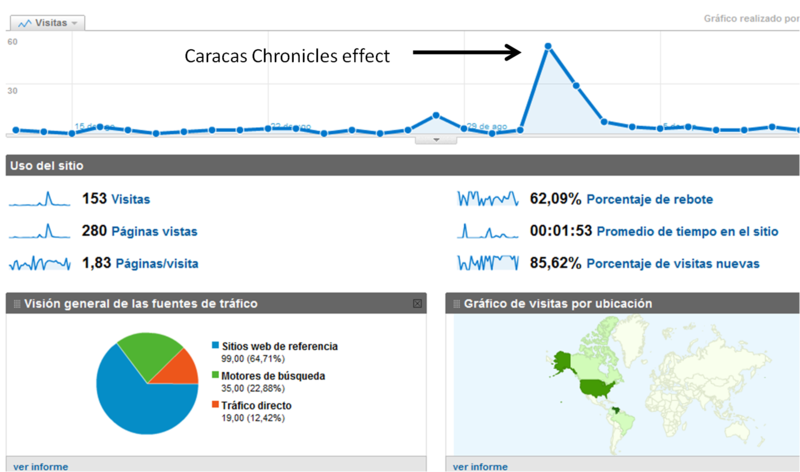 However, as the Dutch saying "Meten is weten" (To measure is to know), I want to show the impact of being referenced in Caracas Chronicles in my normal traffic. As you can see in the graph above, it increased 20-fold the amount of people who get into my blog, having 60 visitors in one day! Hehe still way to go, but it is a very good motivation to keep working, and keep organizing the information available about petrochemical activities in Venezuela.